How: After reading Sandra Boswell’s Prototcol Matters and finding that I have more gray hair than I care to own up to, I have realized that it doesn’t take a lot to raise children with high self-esteem. It does, however, take much of the right thing! The most important concept that our children must understand to have confidence in themselves is that Christ did it all for them on the cross. Their sins were forgiven and they can’t work hard enough to make our Father pleased with them. Their value, worth and salvation is found in Christ alone. Christ has fought the fight for them and their sins are washed clean by His precious blood. 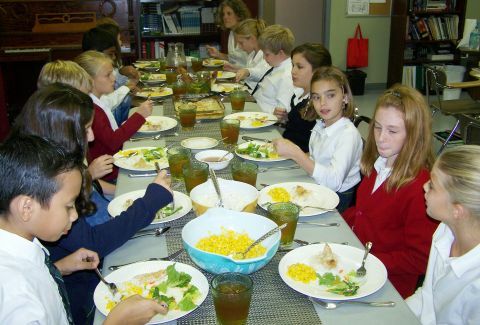 The next skill that children need in order to grow strong and grounded is manners. A child who knows and has applied manners in a variety of situations and with people of mixed age and gender has such an advantage in life. When a young man knows that he shouldn’t sit before all the ladies at the table have been seated first, he is at a great advantage in life. A young lady who knows how to graciously accept a door being held open for her is light years ahead of what our generation today breeds. 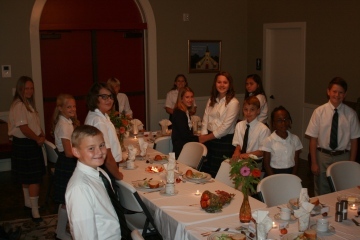 It is because of these convictions that I remind my students daily of Christ’s love for each one of them, and it is because of these convictions that I arrange to have an etiquette meal brought in to 6th grade once a quarter. Using Protocol Matters as a diving board, I try to plunge as deeply as possible into all the do’s and don’ts that make up our world of manners. It is tricky to present these rules as being something that will benefit my students in the coming years without it sounding like Mrs. Bertke is just trying to add more no-no’s to our life! After a brief and joyful discussion about the importance of manners, we get down to the nitty-gritty! 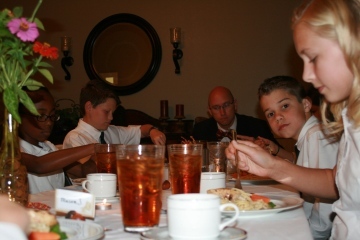 I teach my students the details of how to approach a table, when to be seated, which hand is used to place their napkin in their lap as well as appropriate table talk. I always tell my students that they will receive a grade for their attention to their own manners, and we proceed to partake of a delicious meal that a parent brings in. 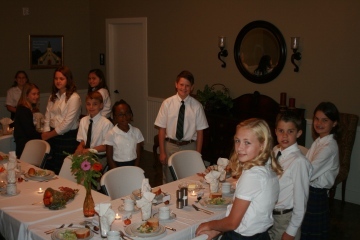 The happiness and warmth that is shared during our etiquette meals is indescribable. The students are actively thinking of their neighbor and how to include all those around them in the table’s discussion. The gentlemen are actually acting like gentlemen! The ladies are considerate of the food that is being placed in their mouth. 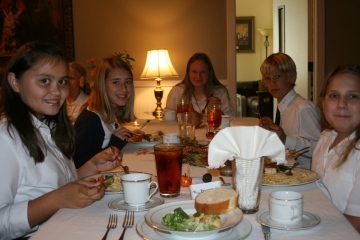 It is a time for their teacher to sit back (not literally) and enjoy watching my active, rambunctious, and occasionally gross students interact in a civilized and courteous way that is reflective of the wedding feast that we will partake of in glory. Praise God for our school. Praise God for our country. Praise God for our headmaster that allows me to slightly disturb the regular rhythm of our school day so that we might send out straight and strong arrows into the world of darkness which, upon hitting their mark, may do so with graceful manners! By the age of sixteen, George Washington had copied out by hand 110 Rules of Civility & Decent Behavior in Company and Conversation. They are based on a set of rules composed by French Jesuits in 1595. You can read them here. We should teach our boys to follow rules like these so that they will be real men. We might be tempted to dismiss these rules as fussy or silly, unsuitable for men, outdated tenets more appropriate for a time of powdered wigs. But in fact George Washington — a man among men to be sure — lived by them through military campaigns and presidential politics. They are guidelines for a mature person who has a clear focus on others rather than self. That’s the power of manners.